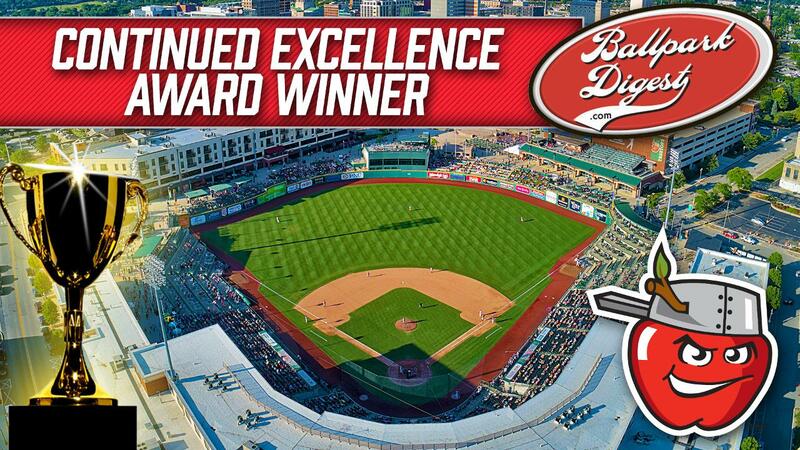 TinCaps Earn Ballpark Digest's "Continued Excellence Award"
FORT WAYNE, Ind. -- The Fort Wayne TinCaps have earned Ballpark Digest's 2018 "Continued Excellence Award." The honor, for which all 160 teams in Minor League Baseball were eligible, recognizes the success of the TinCaps as an organization not only this year, but throughout their first 10 seasons at Parkview Field. Ballpark Digest made its selection based on the fan experience the TinCaps have maintained and the positive impact Parkview Field has had on redevelopment in Downtown Fort Wayne. "This is an almost unbelievable honor," TinCaps President Mike Nutter said. "Kevin Reichard and everyone at Ballpark Digest do an amazing job covering our industry, so any time we're highlighted by them among our great peers around Minor League Baseball, it's not taken for granted. While this award recognizes the continued excellence of the TinCaps, it's truly a reflection of the continued support we've received from our fans, sponsors, the San Diego Padres, media, and just about everyone around the Fort Wayne area. We can't thank them all enough." The Single-A Dayton Dragons (Midwest League affiliate of the Cincinnati Reds) and the Triple-A Omaha Storm Chasers (Pacific Coast League affiliate of the Kansas City Royals) received Honorable Mention for the award. The TinCaps follow the Vancouver Candians (Short-Season A affiliate of the Toronto Blue Jays in the Northwest League), who claimed the trophy in 2017. Through Parkview Field's first decade, the TinCaps have drawn more than 4,000,000 fans. (For comparison's sake, the Fort Wayne Wizards needed 16 seasons to draw 4 million fans at Memorial Stadium from 1993-2008.) Additionally, Parkview Field has welcomed more than 1 million guests beyond TinCaps games as the ballpark annually hosts 700-plus special events. In June, in an online vote conducted by Ballpark Digest, Parkview Field proved to be the pick for Best Ballpark in Class A. The TinCaps will receive trophies for these awards in December at the Baseball Winter Meetings in Las Vegas. "For as great as these first 10 years have been, and for as much as we relish recognition like this, it's a unanimous feeling for everyone on our staff at Parkview Field that we're committed to working our hardest to make 2019 better than any season we've had yet," Nutter said. The TinCaps are set to open their 11th season at Parkview Field on Thursday, April 4 (7:05 p.m.) against the Lansing Lugnuts (Blue Jays). For information on season tickets, group outings, and more, call 260-482-6400.